Thus it is possible to repair a damaged system, to rescue data or to scan the system for virus infections. Just double-click on the rescue system package to burn it to a CD/DVD. You can then use this CD/DVD to boot your PC. Version 2016.9.18 is a freeware program which does not have restrictions and it's free so it doesn't cost anything. 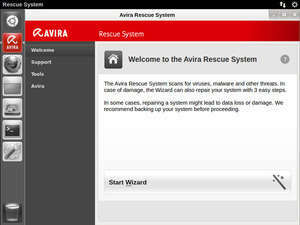 For security reasons, you should also check out the Avira Rescue System download at LO4D.com which includes virus and malware tests. Additional screenshots of this application download may be available, too.